Do we need robots to take care of people? Work is indeed confronting a new wave of disruption. So far the human kind has thrived in all technological revolutions. Will humans thrive when advanced robotics become mainstream? So much can be said that the nations cannot become or maintain their competitive advantage without strategies and implementation of robotics. Advanced robotics are 3E technologies. They are Everywhere, new ideas and products Emerge almost daily and they grow Exponentially. Advanced robotics include sensors, artificial intelligence, an internet protocol and they are designed in new ways – and they are ubiquitous. Advanced robotics communicate and cooperate with the humans in the same way we have seen humans cooperate together, and beyond. Robotics can enhance the human capacity to achieve something fantastic we never seen before. Robots are coming out from factories and workshops. They are moving into homes, services and hospitals. They can help us to solve the enormous challenge of taking care of the sick and elderly as the demographic shape moves from a pyramid to an urn. Almost daily we read horrifying stories about unhuman treatment of elderly patients. They are bound into their beds or chairs, they are yelled at, they are left in their diapers for days. At the same time the nursing personnel gets more and more exhausted as they cannot perform in their work according to their own high values – and if I may mention all this is not very cost-effective for the society. There is a triple-loss: the loss of dignity of the patients, the loss of motivation of the nursing personnel and the loss of economy of the society. Not really a winning helix, one could say. Advanced robotics can help. There are already many new applications to help the elderly and people with disabilities to live independently and with dignity at home but the robotics keep developing in an incredible pace. In the very near future we will see amazing robots helping people to live better lives. One important branch of health-robotics is surgery. Advanced robotics turn surgery to minimally invasive operations decreasing trauma in the body and reducing the time of the stay in the hospital. Robots are also invading the digital world. Professor Tony Dyson said at Helsinki Robotics Week 2013 that the true revolution happens when the virtual robots come. In healthcare virtual robots can take care of all routine communication as well as putting the systems to work in an effective way. ”Many of the problems that are hindering the effective use of digital health systems can be fixed with a robotic layer”, says Petri Karjalainen from OpusCapita Oy. The future of robotics is ours to invent. We are organizing AiroBot in Helsinki in April 8-9 to gather robotics start-ups, innovators and investors together in order to make the future happen in form of new ideas, new products and new ways of making products. AiroBot brings together ideas and people who move the world to a new and awesome direction! We look forward to seeing many life improving innovations of health robotics in AiroBot! Welcome! Cristina Andersson is the initiator of Robotics Finland movement and the curator for Helsinki Robotics Week. Helsinki robotics week gathered in 2014 over 5000 people together to become acquainted with the possibilities of robotics and to meet the robots themselves. 2015 we are looking forward a new success as we started cooperating with Messukeskus (Finnish Fair Corporation). 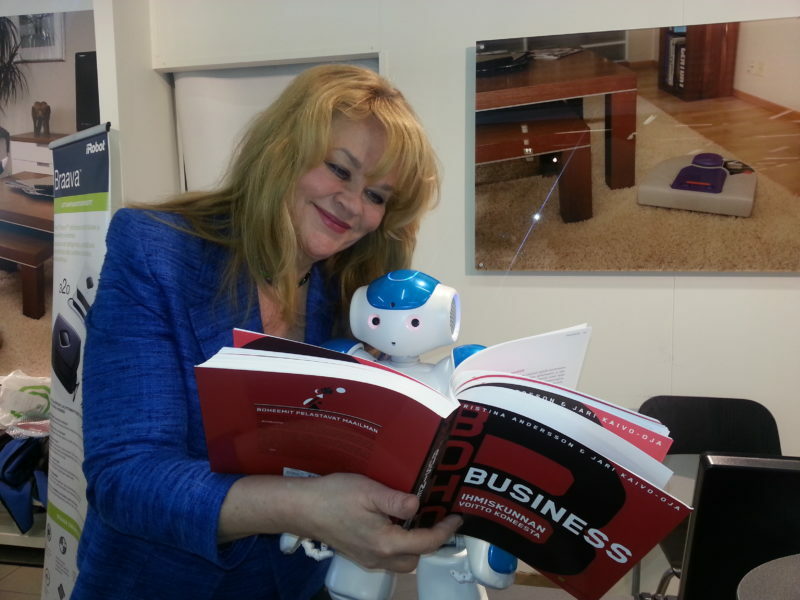 Cristina is also the coauthor of BohoBusiness – Victory Of Man Over Machine (coming up in English from Talentum 2015).